The 66th Session of the U.N. General Assembly debate continues today in New York City with remarks expected from President of the European Council Herman Van Rompuy and Iranian President Mahmoud Ahmadinejad, among others. Erdogan says the actions of the Syrian leadership are unacceptable. "One can not prosper through oppression." Erdogan: "Turkey's support for a Palestinian state is unconditional"
Erdogan: It is Israel that uses disproportionate force, it is Israel dat does not abide by international law. Erdogan: "Israel did not comply with 89 binding UN resolutions ... but the UN stood helpless"
Erdogan slams the UN for its response to the famine in Somalia. "No one can speak of peace, justice and civilization in the world if the outcry from Somalia is left unheard," the PM says. Erdogan: "Today the United Nations does not demonstrate the necessary leadership to help mankind prevail over its fears for the future." 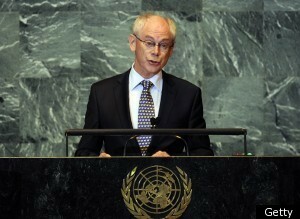 Van Rompuy: "The status quo is not an option."